God bless you Deputy Jacob Keltner for your service and sacrifice. Thoughts and prayers go out to your family and friends, and to your brothers and sisters from the McHenry County Sheriff’s Office. Rest In Peace Brother. RIP Jake. We all miss you so much already!! Rest in peace and Olav Hashalom Deputy Sheriff Keltner. Today a part of America was assassinated with Deputy Jacob Keltner’s death. 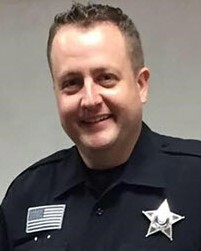 This is an outrage, and my heart aches for his family, friends, colleagues, the men and women of the McHenry County Sheriff’s Office, and the people of McHenry County. God bless Deputy Jacob Keltner, and I thank him for his selfless sacrifice of service. Prayers and thoughts for the immediate family and fellow officers. Thank you Sir for your service and sacrifice. God bless all our first responders. RIP, Deputy Keltner. Praying for you and your loved ones. Our hearts are broken and we are praying for this family and department. May they feel the comfort, strength and grace of our Lord Jesus. My family and I would like to extend our sincere condolences to the family, friends, and fellow co-workers of Deputy Sheriff Jacob Keltner during this difficult time. May they find comfort and support from those around them. May happy moments from the past bring forth precious memories to cherish for a lifetime. May God help heal their aching hearts. Thank you for your service and may you rest in peace Deputy Sheriff Jacob Keltner. Rest in peace, brother. May God open His arms to you and say, "Step forward now, My son. You have borne your burdens well. Come walk a beat on Heaven's streets. You have done your time in hell." Rest in peace, Deputy Keltner. You deserve your divine reward. My prayers go to family, friends, and the community.